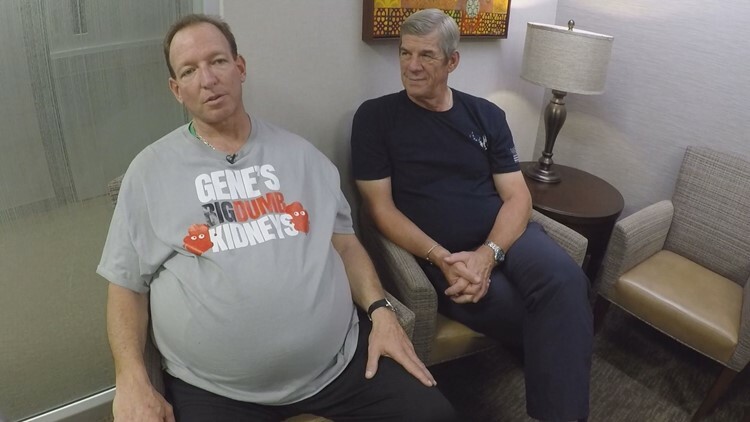 Doctors believe Gene Okun, a former powerlifter and bodybuilder, has the largest kidneys in the world. ROCHESTER, Minn. - Champion. A title Gene Okun relishes. Now, the man once-dubbed "Baby Arnold Schwarzenegger" holds a title he never wanted. “I can’t say growing bigger kidneys was on my list of dream accomplishments. Unfortunately, as luck would have it, I am now famous for big kidneys and not bodybuilding,” he said. 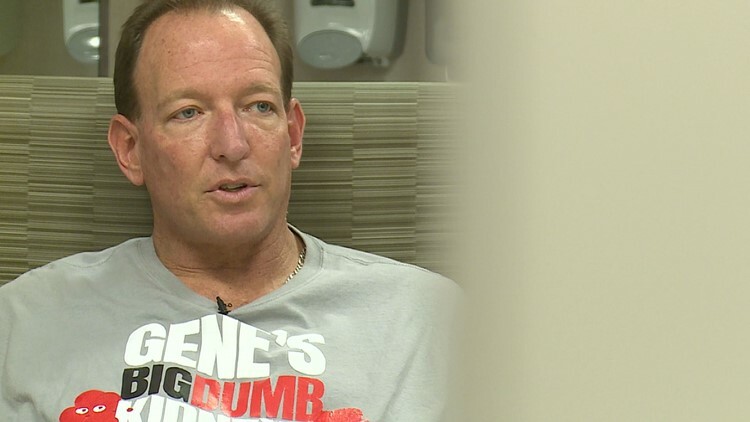 Gene, who lives in Southern California, has genetic kidney disease. It’s called polycystic kidney disease, or PKD. The 50-pound dumbbells he used for training are the same weight as his kidneys. PKD is a genetic disease passed from an affected parent to their child causing uncontrolled growth of cysts in the kidney. Most people with PKD experience kidney failure by age 60, according to the PKD Foundation. The same disease Okun lives with ended the life of his father, also named Gene. For years, Okun, 52, tried to rewrite his story. He launched an online campaign called Gene's Big Dumb Kidneys. Okun said he wanted to use comedy to raise awareness and search for a living kidney donor. He calls the left one "Big". The right one is "Dumb". That’s how Okun describes his kidneys. Because of the disease, Gene never married or had children. “That is a real traumatic thing as a child growing knowing you will need dialysis or transplant,” he said. But Gene has a chance his father didn't. All thanks to his best friend, Bill McNeese. Most friends loan money and donate their time --- but an organ? In June, surgeons with the Mayo Clinic performed the lifesaving kidney transplant Gene needed. 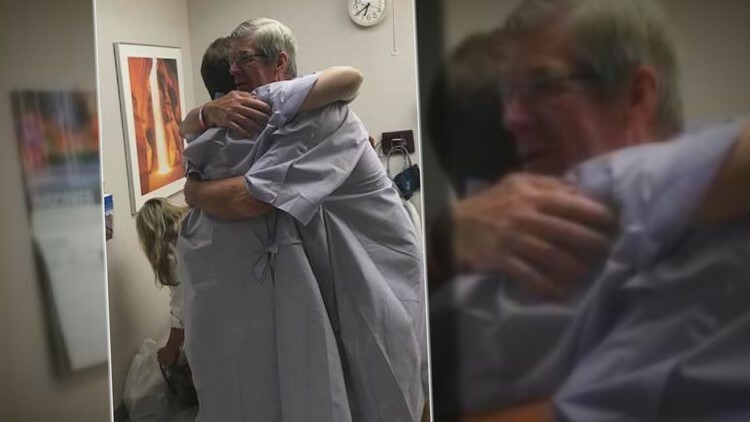 Okun said he is “grateful for the blessing” of his living kidney donor. Mayo Clinic's Dr. Mikel Prieto led the surgery. Initially, he thought it would take two hours, an hour for each kidney, but it took 12. Okun said he chose the Mayo Clinic because of a minimally invasive technique doctors used to laparoscopically remove the diseased kidneys. Because of it, Mayo surgeons can complete two procedures, with one surgery. According to its website, the Mayo Clinic pioneered the process of performing both kidney laparoscopic removal and transplant surgeries for polycystic kidney disease patients simultaneously. This procedure eliminates the need for two surgeries where the old kidneys would be removed first. Living donation saves two lives: The recipient and the next one on the deceased organ waiting list. Kidney and liver patients who are able to receive a living donor transplant can receive the best quality organ much sooner, often in less than a year. Following the surgery, Okun was able to see his feet. A sight he hadn’t seen in years. “My stomach was flat. I could see my feet. Blown away I wasn't so round, anymore,” he said. Gene and Bill, friends for 20 years, are now family for life. “I am grateful for you saving my life. I truly wouldn't be in this spot if it wasn't for you stepping up and wanting to give me life,” Gene told Bill days after the surgery. McNeese said he always wanted a brother. Now, he has one in Okun. Brother is a title Okun accepts with pride.